Little treasures found in Venice! I started living in Venice, Italy in September 2009. I was doing a costume design internship with a company called Atelier Pietro Longhi in the heart of the city. It was a fabulous experience and I feel I learnt more from my 4 month internship there than I did in 3 years at university!! And living in Venice was a magical experience if not a little boring at times too. I refer to it as sleepy town because not much is happening here for young people! 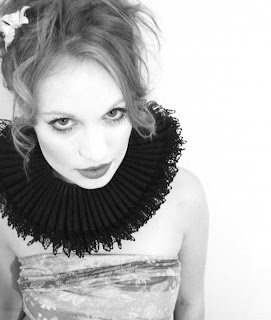 In my internship I lernt how to make Elizabethan Ruffs, something I had been so eager to learn for a long time! I also learnt how to construct costumes mostly from the 16th & 17th Century Venetian Fashions. When work was over I asked my Maestro if he could teach me how to construct an 18th Century Corset as I have been looking at the construction in books for many years and found it extremely complex so I wanted to take the time to understand the construction of the undergarment. I was at Palazzo Mocenigo a few months ago. The palace was home to the Mocenigo family since the 17th Century. Within this palace is a small Costume collection which mainly show Venetian fashions and in one of the display cabinets on the floor was a tiny, heavily bones mid 18th century Corset, the construction of this delicate little masterpiece was amazing. So much detail and the precise stitching all done by hand as sewing machines had not yet been invented! I have also just found out that this Palace has a library of the Fabrics and Costume History Centre, which I will take a good look at! So while I was working at the Atelier I was staying behind later to work on my very own 18th Century Corset. There are so many bones in this construction and I enjoyed every moment of making it except the hand stitching the bias binding on to each individual tab at the bottom of the Corset. The tabs are the tongue shaped pieces at the bottom of the Corsets used in 17th & 18th Century corsetry. The pattern on the fabric and colour I used was not historically correct but I just wanted to make something to test how it worked and with the final product it was more for a fashion photo shoot than to be historically accurate. I ended up doing a photo shoot at an abandoned hospital just outside Berlin called “Belitz” I went along with a small team which included the model Stephanie Peregrinus and Photographers Ray Demski and Leena McCall. I was really pleased with the results! 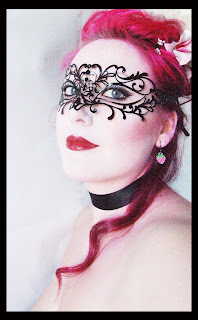 A little treasure I found in Venice the other day was a beautiful metal mask. It stood out to me because it was different from all the other Venetian masks you see…and there are so many shops here selling the same product that its quite tiring to see the same thing over and over again, but as I passed a window in a small ally way which I had never ventured down before I saw this beautiful little dainty mask calling out to me. Nothing extravagant and bursting with colours, just simple black delicate pattern and perfectly fitting to my taste! I absolutely love the metal mask you found in Venice. It's so uniquely beautiful. You have a great blog.